I recently moved into a new home and the condition the previous tenants left the house in was a disaster. The house smelled funny, had dead mice and the sinks, toilets and showers were in horrible shape. I purchased a gallon of XTREME CLEEN™ in hopes that it would do all that it says it does, and I was ecstatic to see the results I got. I began cleaning the ceilings in every room and worked my way down to the floors. I cleaned the entire house with XTREME CLEEN™ and could not be happier with this product. I could literally see it cleaning as the walls and floors changed colors in front of my face as they came clean. However, the really impressive part came when I cleaned the sink with XTREME CLEEN™. I was ready to take the sinks out of the house and replace them because they were in such bad condition – nothing would get them clean. I tried other products but none could do the job. I decided to test the power of XTREME CLEEN™ before I replaced them and see just how well XTREME CLEEN™ worked. 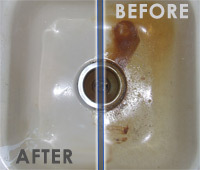 I put the product in the sink, let it sit about 10 minutes and scrubbed all the grease, grime and residue out of the sink. My jaw literally dropped as the seemingly un-salvageable sink began to look like a brand new sink. The smell is gone from the house and the money XTREME CLEEN™ saved me by restoring these sinks, showers and toilets in the house was well worth the money spent on this product. I would recommend these cleaning products to anyone and everyone. It’s a must have in my home now.